Merrell All Out Rush Review - To Buy or Not in Apr 2019? The Merrell All Out Rush belongs to the M-connect series, which embodies a theory behind all of the shoes belonging to the line. The low millimeter drop height provides the low profile necessary to get accustomed to seemingly barefoot trail running while still providing a good deal of comfort and protection during your run. This shoe can be considered a minimalist enthusiast’s ideal trail shoe with the benefit of still being lightweight. The Merrell All Out Rush was designed to hit a balance between responsive feel and suitable protection that will deliver the best performance and experience for the user, so does this shoe really live up to the experience that it promises to provide? The outsole is where the Merrell All Out Rush makes a name for itself, clearly standing out against the competition. The outsole features the M Select Grip, which is a 5 millimeter individually separated aggressive circular lug pads on the bottom that assist with superior traction on loose surfaces. The toe and heel area have loose ridges that only enhance grip and traction while helping you propel yourself properly over compromising terrain. The thick rubberized outsole is very protective for your underfoot. If you're looking for a shoe that offers protection and the guarantee of a good grip on multiple surfaces, the M Select Grip outsole belonging to the Merrell All Out Rush is a good outsole to have under your foot. The midsole on the Merrell All Out Rush is another unique and amazing feature that enhances the overall experience of the shoe. The in-house Merrell made Unifly material can found on the midsole to provide many benefits to the user of the shoe. Unifly is the midsole foam material that was technologically developed by Merrell. Tt possesses firmer material on the heel and forefoot area that behave as shock impact absorbers. There is a softer foam material in the midsole bridging the gap between both firm shock impact absorption material pads. This softer material is responsible for the responsiveness that you will get from the shoe, translating what's beneath you on the ground. An extremely breathable lightweight mesh and urethane blankets the majority of the upper. The patented Omni Fit lacing system can also be found on the upper, which depending on your foot size, can be a good amount of security or overly secure, causing discomfort. The All Out Rush offers some reflective hits for safety during evening hour use. The materials that make up the upper make the shoe lightweight, breathable, and warm. A wide toe box can be located in the forefront region of the upper, which is good if you have wider feet, but if your foot is more narrow you may experience slippage due to the great amount of room offered in the toe box area. The Merrell All Out Rush falls into the classification of being a lightweight trail shoe coming in at 11.1 ounces in the men's version, and 9.3 ounces in the women's version. The overall weight of this shoe is very impressive given the amounts of features and protection that also come included in the shoe. This shoe falls in line with the weight class of many average running shoes that don't come with the addition of protecting your foot against outside elements that you may run into during trail running. The synthetic mesh material used on the Merrell All Out Rush is eye opening due to it exhibiting the wonderful capabilities that a material can provide for running shoe. Breathability is great on this shoe, the upper has a lightweight well ventilated mesh that allows a sufficient amount of circulation for your foot. The shoe's appearance, at first glance, may seem to keep the heat in and the cool out, but proved to do the exact opposite. Trail running shoes tend to have a habit of using materials that favor protection and durability over breathability but this shoe happens to be very breathable. This shoe will keep you cool thanks to the cool air intake the material allows as trail temperatures heat up. This shoe is very comfortable for a trail running shoe, keeping in mind that it was created to endure conditions that require constant protection. It has found a balance between sufficient protection and sustainable comfort. The comfort begins with an upper that's made from a breathable, lightweight mesh that contours to the shape of your foot. The midsole follows up with a mix of Unifly foam and EVA adding a level of response and comfort not often associated with a rugged trail running shoe. The description "stylish" and trail shoes often appear to be antonyms when brought up in the same conversation, but this isn't the case with the Merrell All Out Rush trail running shoe. The aesthetics of the upper are very eye-catching, having a solid uniform mesh color, complemented by a contrasting color on the midsole that's typically very vibrant in nature. The shoe sits low to the ground, giving it a very fashion forward minimalist look while giving hints at a functionally aggressive outsole underneath. The Merrell All Out Rush is a very durable shoe, just by design alone, there are noticeable aesthetic cues that allude to this shoe's ability to last. The thick aggressive rubberized outsole was designed to endure conditions that other running shoes would fail miserably at. The mesh is very tough, lasting the test of time and managing to be lightweight at the same time. Even with the shoe being used for harsh running conditions, the shoe didn't break down or falter in the durability department. There is a decent level of basic protection available, but not as much as would be desired for the types of terrain that this shoe was meant for. Rocks and many other hazards are common trail occurrences and this shoe lacks a rock plate. The Merrell All Out Rush does, however, offer a TPU protective toe cap for other seen and unseen hazards that you may encounter. Decent responsiveness feels of the ground while not being overly cushy or too stiff. The softer material built into the Unifly midsole is the primary factor responsible for the great amount of responsiveness received from the shoe. At first glance, it's possible to assume that such a generously coated outsole would naturally limit the responsive ability of the shoe, but the Merrell All Out Rush remains responsive as ever when being put to the test. 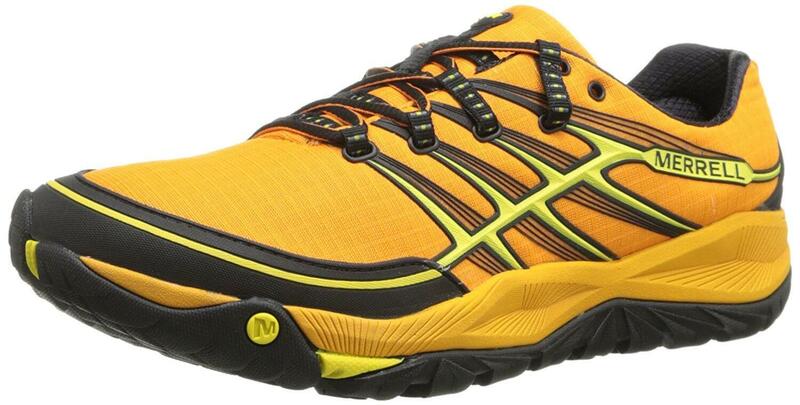 The Merrell All Out Rush is a daily neutral trail running shoe. The Unifly midsole foam mixed with Ethylene Vinyl Acetate, or EVA, is responsible for the majority of the support you will receive from this shoe. The shoe provides a good amount of support for runners who don't have problems with overpronation or supination. If you're aware of the roll on your foot leaning in either direction other than a neutral direction, it would be better to explore other shoe options that would support your style of running more effectively. The type of terrains intended for the Merrell All Out Rush are trails and off-road tracks. During testing, it was noted that these shoes even work well on pavement type surfaces. The durable and aggressive M Select outsole widens the spectrum of surfaces that this shoe is allowed to traverse without much difficulty, and this shoe even performed well on snow saturated surfaces. This shoe proved to perform very well over many trail types, from beginner trail paths to the more experienced. No matter what the surface, have no fear of slip when using the Merrell All Out Rush for grip. The design of the outsole was strategically set up to optimize the traction on the plethora of paths and trails you may come across while wearing these shoes. The initial retail price for the Merrell All Out Rush was slightly over $100 but has significantly decreased over time. These shoes can be found for a great deal as they have been discontinued by the original manufacturer. The Merrell All Out Rush already provided great value at its initial price but proves to provide even more value for your pockets with a substantial price drop. The All Out series was specifically developed for runners who desired protection while still having the ability to move naturally and this shoe nails the balance of both masterfully. The M Select lugs located on the outsole make way for more movement than most other trail running shoes while retaining its superior grip. The upper synthetic mesh follows your foot with each flexible turn and the twist you desire. The flexibility factor with this shoe is nothing short of amazing. Merrell has come up with a lacing system called the Omni Fit, which will emulate the custom fit of a glove and keep the midsection of your foot locked down in place while you run. The heel area provided a good amount of stability that took any unnecessary stress off of the joints or the arch area. Runners who seek to use the Merrell All Out Rush should keep in mind that this is a neutral trail running shoe and if your run style requires any additional stability aiding features, you should seek a more suitable trail running shoe option to fit your needs. The drop for this shoe stacks up at 6 millimeters, which keeps the overall profile and your foot, low to the ground. The goal of this shoe is to provide protection while remaining minimal in design, avoiding becoming bulky because of the additional features, and a low drop height puts emphasis on how well this shoe stuck closely to that idea. The Merrell All Out Rush is packed with an abundance of features and has the ability to perform well over numerous amount of terrains and conditions, but is this shoe the right shoe for your running needs? The All Out Rush is a daily runner for runners who have to experience rougher terrain than just pavement. These shoes are excellent for harsh element runs like traversing snow and keeping you warm in the process, to utilizing the trademarked M Select grip to stick to gravel and other looser materials you may have to face along a dry trail. These shoes even perform well on regular pavement although that wasn't their direct intended purpose. Give these shoes the green light if you know you will be experiencing more challenging terrain and need a shoe that will support and protect you throughout all of your travels.